You’ve just enjoyed a wonderful Thanksgiving or Christmas dinner. Clean up begins, and you wonder what to do with the huge leftover turkey carcas. You know your grandmother would be agast that you just throw it away, but you aren’t exactly sure what to do with it. Don’t let that turkey go to waste! 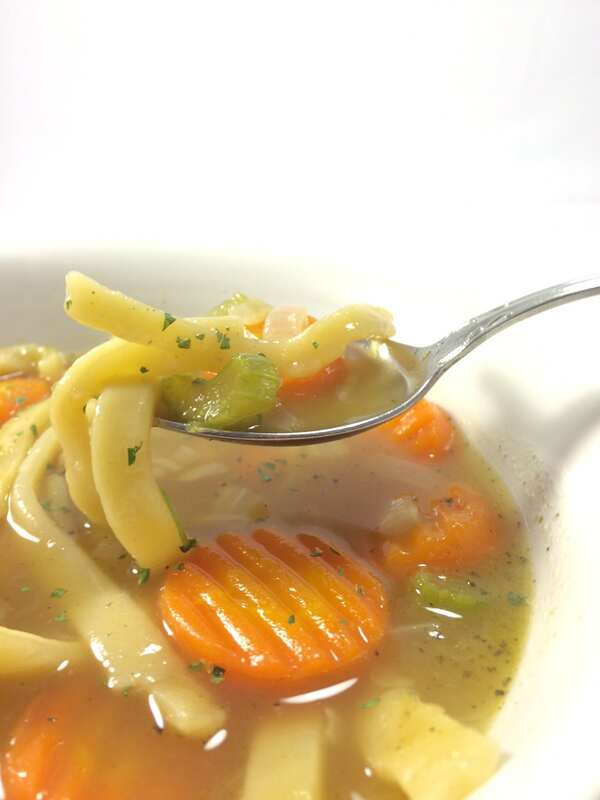 Homemade broth is healthier and tastes better. It’s not that hard! I’ll show you exactly how to do it. This works equally well with an uncooked or store-bought, cooked rotisserie chicken. I’ll show you the modifications. Bone broth is so nutritious that some people aim to drink some every day. Check out this post for how to make beef bone broth. But if you live far away from family or someone to teach you, you might not know how to make turkey or chicken broth (I didn’t). 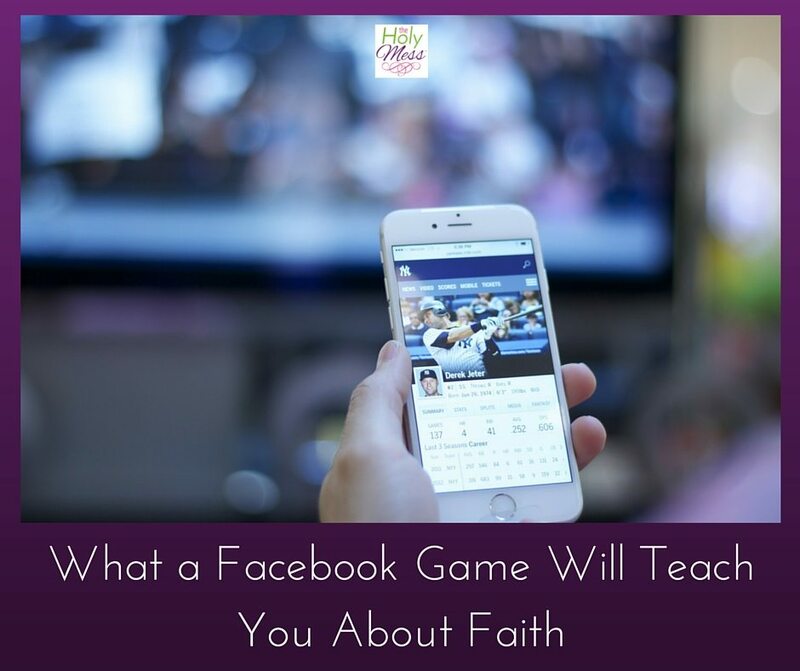 Here are the exact steps to take. You need a big pot or crockpot. This takes some time, so don’t plan to do this an hour before you want to use the broth to make dinner. Ideally, the broth should be made the day before. You’ve just enjoyed a wonderful Thanksgiving or Christmas meal. Here’s what to do with the leftover turkey carcass. 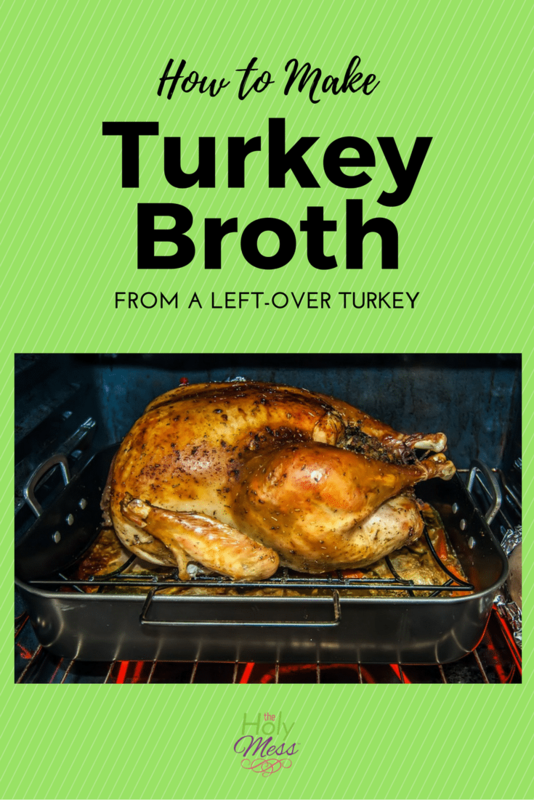 How to make broth or stock from a left-over turkey carcass. Pick all the meat off the bones and store it for later recipes. Get a large stock pot or crock pot. I personally throw away any leftover skin, since I'm trying to cut down on fat. You can include it if you want. Put the whole turkey carcass in the pot and cover it with water. Cover the whole thing with water and bring to a boil. The turkey will release some juices so don't fill the pot clear full. You’ve just enjoyed a wonderful Thanksgiving meal. What do you do with the left-over carcass? I personally throw away any leftover skin, since I’m trying to cut down on fat. Add 2 tsp poultry seasoning. (No poultry seasoning? Add 1 tsp garlic powder, 1 tsp ground sage, 1/2 tsp thyme, and a shake of black pepper. Also check out this homemade onion soup mix recipe. Cover the whole thing with water and bring to a boil. The turkey will release some juices so don’t fill the pot clear full. My preference is to use the crock pot. Throw the whole turkey carcass into the crock pot and cover it with water while you are cleaning up dinner. Add spices, put the lid on, turn it on low and forget about it until morning. 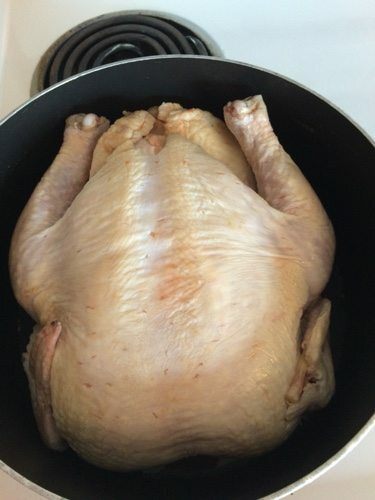 In the morning or after the broth has cooked for 1-2 hours, remove the lid and allow the turkey and broth to cool some before attempting to handle it. What makes a good broth or stock is boiling the bones. Bone marrow makes a rich, nutritious broth so the goal if cooking it for a long time is to get the marrow out of the bones. Use a large strainer (the larger the better) to strain the broth from the turkey carcass. Take care if the broth is still very hot. Strain it so that they turkey broth is in a large bowl, such as a mixing bowl. Most of the turkey bones can be thrown away at this point, but if you see some good bits of turkey meat left over, save those for a recipe. You now have a large bowl full of turkey broth. You can use the broth right away, or you can cool the broth in order to remove some of the extra fat (my preference). 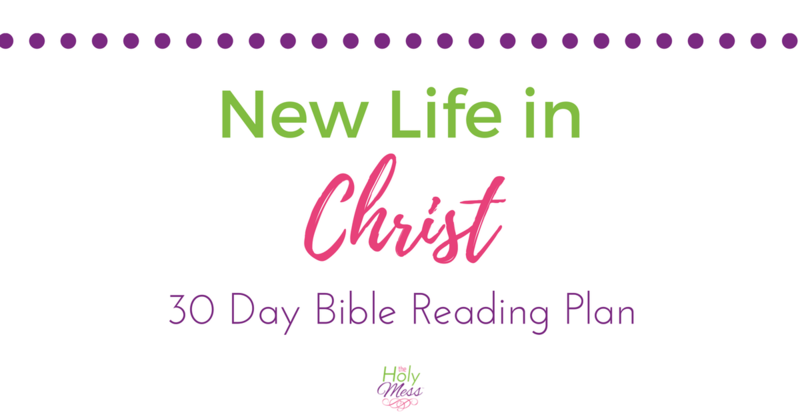 Keep reading to learn an easy way to do this. 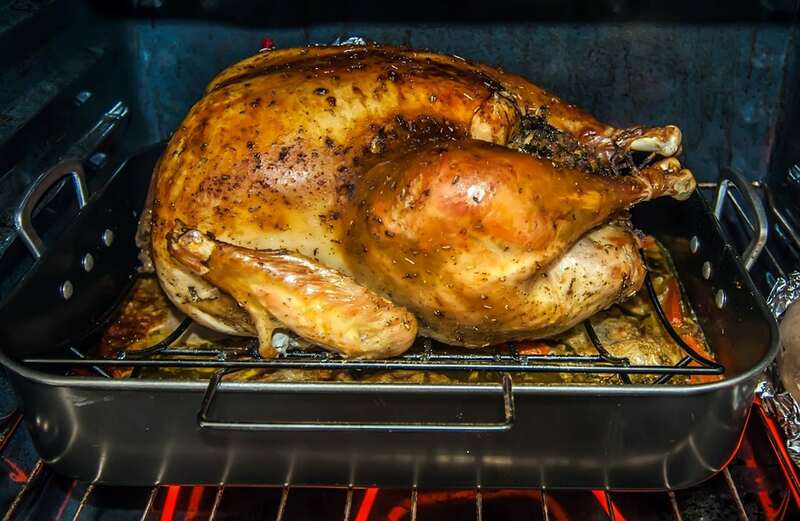 The steps are similar to cooking with a turkey carcass, but this time you are starting with a raw bird. Reach your hand into the cavity and pull out the innards, which is the neck and gizzards. Sometimes these are in a little bag and sometimes they are just in there. It’s gross so do it quickly. These can be thrown away. If there are large pieces of fat and skin hanging off the bird, throw these out or cut them off with kitchen shears. Prepare your chicken following the recipe steps above. Boil 1-2 hours or until meat is no longer pink. 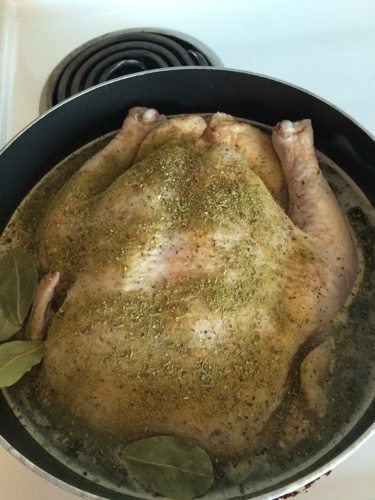 Boiling a chicken gives it a wonderful flavor, and it’s very moist and tender meat. The meat will fall off the bones easily. Anytime you use a store-bought (or homemade) rotisserie chicken, you can use the leftover carcass to make a wonderful chicken broth or stock. Follow the same steps as you would for a turkey. The crock pot is your friend, but a large soup pot works just as well. I highly recommend removing the extra fat from your chicken or turkey stock. Easiest method: after removing any meat and bones, you now have a large bowl or pot of stock. Put it in the fridgerator overnight. In the morning, the fat will have risen to the top. Skim the fat off with a spoon. You will notice as the broth cooks that it might look more like a thick gel. This is a good thing. Healthy gelatin has been released from the bones making it a rich, nutritious stock. When you re-heat it, it will appear thinner again, like typical soup. Stocks like this are rich and flavorful, so while best used as-is, you can add water to it if needed, or canned chicken or turkey broth. Quick-skim method: If you don’t have time to skim the fat from your broth, here is a quick method that works great. 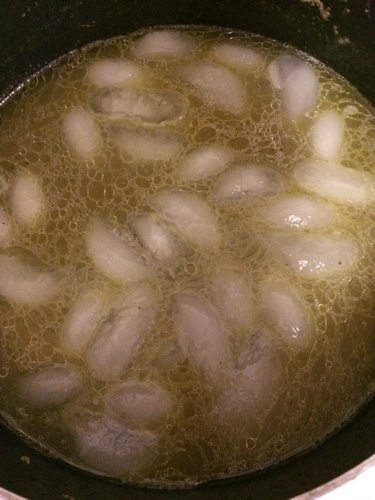 Dump 3-4 cups of ice into your hot stock. The ice will float to the top with the fat adhered to it. Quickly remove the ice and much of the fat will come along with it. Continue with your recipe using the broth. 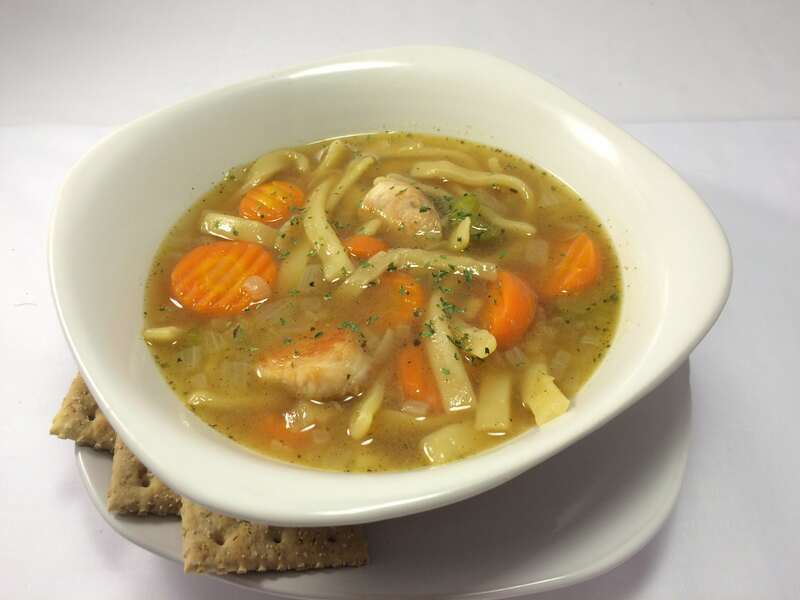 Here is a turkey noodle soup recipe using homemade turkey broth. I think my granddaughter, the cook, would call this stock instead of broth, because it’s made from bones. I like to add carrots, onion, and celery to the cooking water. Yum! Yes, stock is probably the more appropriate term. I looked up some definitions when I was writing this blog and it said the words “broth” and “stock” are used mostly interchangeably these days.